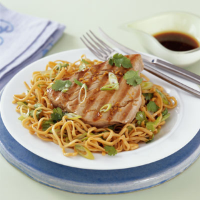 Succulent tuna steaks and a cold noodle salad are served here with a tangy Oriental dressing - delicious for lunch, or supper if the weather is warm. Cook the noodles according to pack instructions. Meanwhile, whisk 2 tablespoons each of the soy sauce and sesame oil together with all the rice vinegar. Drain the noodles and pour the dressing over, turning to coat well. Cover and cool, then stir in the coriander and half the salad onions. Cover and chill. Place the ginger, remaining 3 tablespoons soy sauce and the sugar in a medium saucepan. Cook over a low heat, stirring, until the sugar has dissolved, then bring to the boil. Simmer for 1 minute, then remove from the heat and stir in all the lime zest and the juice of half the lime. Leave to cool for 30 minutes to allow the flavours to infuse. Whisk the remaining tablespoon of sesame oil and the lime juice into the dressing. Wipe a large, heavy-based griddle or frying pan with a little oil. When hot, cook the tuna for 3-4 minutes each side. You may have to do this in batches - keep the cooked steaks warm. Divide the noodles between 4 plates and place the seared tuna on top. Drizzle each generously with the dressing and serve immediately, garnished with the remaining salad onions. The noodles and dressing can be prepared the day before. The cooking time for the tuna is for medium cooked fish; for well done, cook for 5-6 minutes each side.